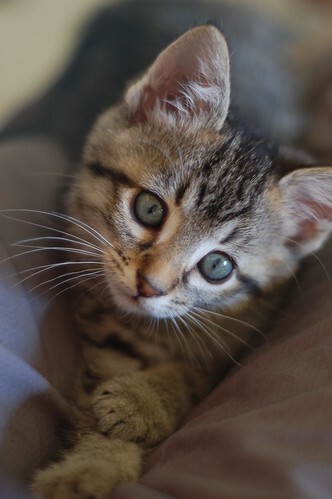 The Itty Bitty Kitty Committee: Tiny Tabby has a Name! Tiny Tabby has a Name! Yes! Tiny Tabby has a name. Eleanor, our lucky winning bidder, has selected the most perfect name for our little girl. It's Betty June Suprenant. "June" is in honor of our Little Drewey Junebug. Eleanor also sent along a list of suggested nick-names, should you choose to tease her on the playground. I think Betty suits her so well. Thank you Eleanor, for your generous bid. And thank for selecting a name so perfect for our Tiny Tabby. The other four naming auctions are still going, so if you want to jump in on the bidding,, please click HERE. Hello Betty June...I love the Drewey connection. I think she would approve of you...you look like a well-behaved little one. What a nice homage to Drewey! I may call her Bitsy, or perhaps BJ. :). Congratulations, Eleanor. hello betty june! how lovely that you're drewey's namesake. and congratulations and thank yous to eleanor! Now I know how to refer to you, Betty June! And, somewhere over the Rainbow Bridge, even Drewey is smiling over the homage to her in choosing the name. Thank you so much, Eleanor! What a lovely name for a lovely girl. I really really wish I could take this one, she's just the sweetest thing I've ever set eyes on. Betty Spaghetti! Is this the same little Miss Suprenant that introduced us to the Itty Bitty Kitty Spaghetti fundraiser? Or was that another adorable fluffy tabby kitty? I can't tell them apart! What a wonderful tribute to Drewey. Eleanor you picked a fantastic name! I'll call her Betty June most of the time because, here in the south, most girls have quite a few syllables in their names or they have double names like Betty June. Well done, Eleanor! How much did the auction bring? Kountess,, I'll announce to the total when they're all over. Pleased to know how to greet you! Will you fly me to the moon? Eleanor, what a perfect name for this very itty bitty girl! I agree that Drewey would appreciate being commemorated. What a wonderful thing to do! I have a sneaking feeling, though, that if she had the opportunity, the Drewster might show her gratitude by giving the little one a quick smack to the noggin to put her in her place before basking in the attention.